EDIT: I’ve gotten a lot of inquiries asking if I would make this dress again – with and without the embroidery details – for other people to purchase from me. Sorry everyone but the answer is a firm no. This dress is very special to me because of the amount of work and love I put it. I won’t be able to replicate the same level of detail because a commission would force me into it. I also do not do commissions in general because I do not have the time and energy to devote to such a large project again. I’m one of the last of my friends to jump onto the Frozen bandwagon. For all of its faults, I still rather like it. Elsa’s character and her song “Let It Go” really speak to the introvert, easily irritated person I can be. I can relate a lot to Elsa since our childhoods were similar: concealing your real emotions, hiding them away from the outside world. 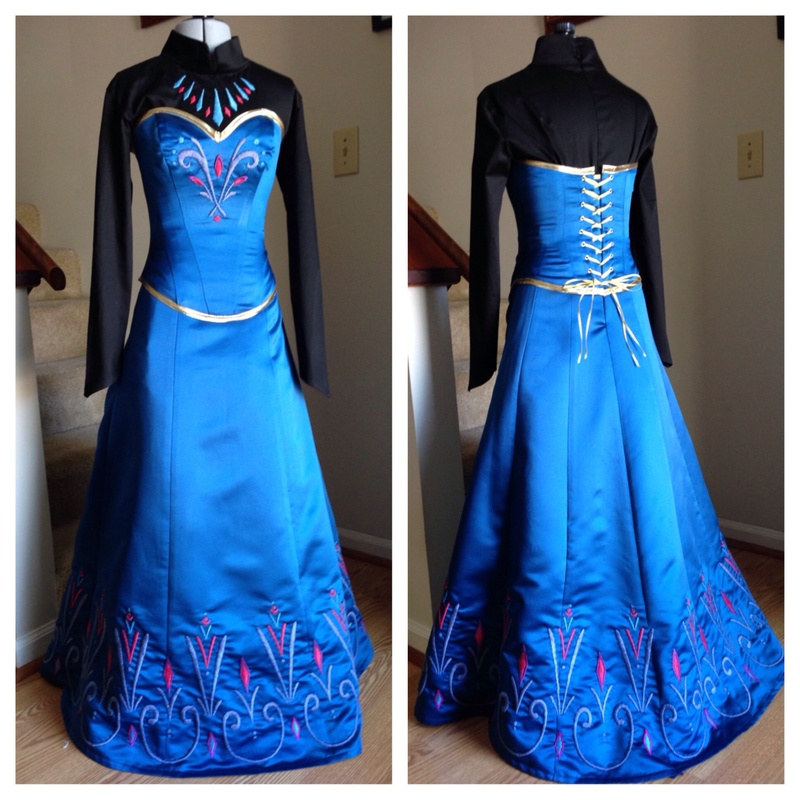 The cosplayer in me really wants to make and wear her Ice Queen dress. But so many people have done it so far that I am waiting for the hype to die down a bit. Instead, I picked another of her dresses to make: the coronation gown. Even after I chose to make this dress, I’ve been hesitant about it. I always said I wanted the bodice to be more corset like and the design embroidered, neither of which I have a ton of (good) experience with. But cosplayers like challenges, don’t we? At this point in time the costume is not 100% finished, but it’s been a while since I’ve posted so I thought I would show some progress shots. The black part is cotton sateen and the base satin is a peacock blue. 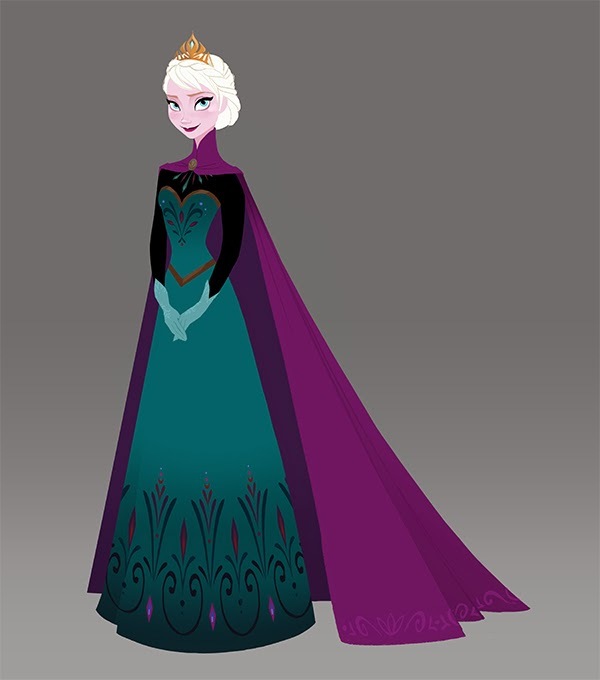 It was really difficult for me to find an appropriate color for Elsa’s dress; every reference image I have changes slightly, some are more green tinted, others more blue. Blue is my favorite color and more representative of Elsa so I settled on a peacock blue that, in certain lights, turns a greenish teal color and in other lights (like on my phone) turns royal blue. The embroidery color keeps changing as well so I used colors that complemented each other and the satin (gray blue, reddish pink, magenta, sky blue, and purple). I’m all for accuracy, but sometimes translating animation into real life is difficult. Fabrics just don’t always come in all the different palettes and textures animation can create. I decided to make the bodice an actual corset for a better shape. The only downside to this is that the small back design has to be omitted. The bodice is made from a slight modification of Simplicity 5006 (mostly I omitted the center front seam but kept everything else). The back is lined in sky blue stretch cotton sateen and is lightly boned. The top of the under dress was made from a really old turtleneck pattern I own and Simplicity 1727 for the collar. Darts (not seen) were put in the front and back to give the top shape and less bulk under the bodice. The skirt is made from Simplicity 5235 (which no longer seems to exists). 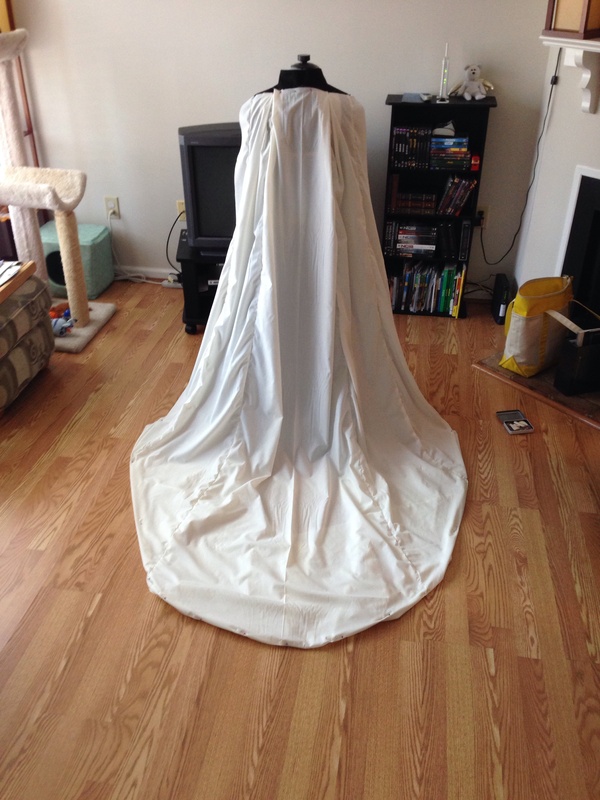 The godet was omitted and the top cut off before the skirt was sewn to the sateen. It closes in the back with a zipper and two hooks and eyes at the collar. All of the embroidery is done by hand. It’s not as neat as I would like, but I can’t justify spending money on an embroidery machine that I would use so infrequently. Hand embroidery isn’t always neat so it gives the cosplay a personal touch. The sateen was a lot easier to embroider than the satin surprisingly. I bruised my fingers frequently attempting to pull the needle through without puckering the fabric too much. In all the embroidery for everything (top, bodice, skirt, and cape) took me about 100 hours, half of which is just setting up for the embroidery. The cape is made of fuchsia satin, dark purple satin, and dark purple velvet. The top was made from a modified Archer pattern; the rest of the cape was draped and cut in scrap cotton before being cut in the satin. 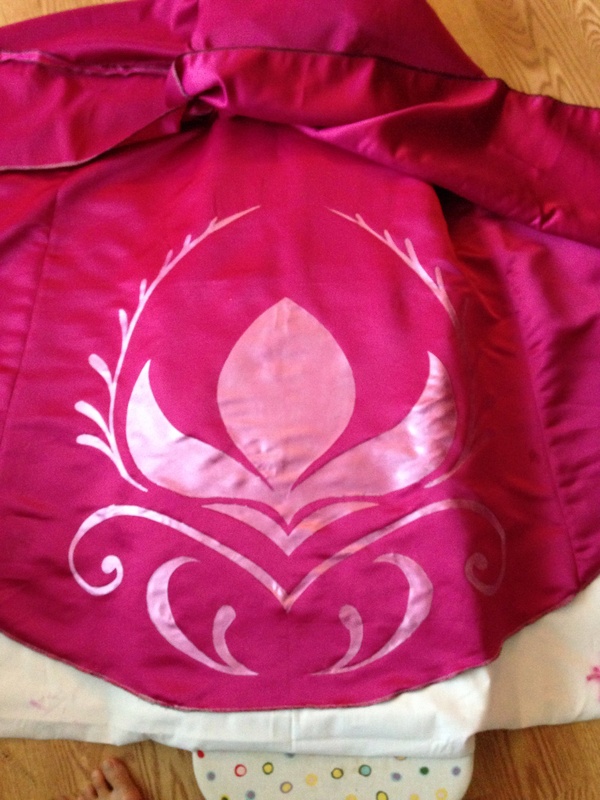 Originally the Arendelle emblem was to be stitched in satin then the edges embroidered, but I was running out of time. Instead I used freezer paper, sketched the design on, ironed it to the cape, and painted in Jacquard Lumiere textile paint in magenta. It came out great (I’ve been told it doesn’t look like paint but heat and bond) except for the edges. To hide them, the edges are being stitched in pale pink embroidery thread in a simple stitch. I only did the main emblem design for time sake. I have all the designs for the cape edge sketched out. I decided to omit them for time’s sake, but also because they are not always seen. The edges are most obvious in concept art; they only appear sporadically in the film. The crown is made of two layers of worbla with a layer of craft foam in the middle. I attached it to a plastic headband but am contemplating cutting off the ends (it squeezes my head without the wig on) and adding hair combs/clips instead. It is currently awaiting gesso priming and painting. A vintage rhinestone will be placed in the center. 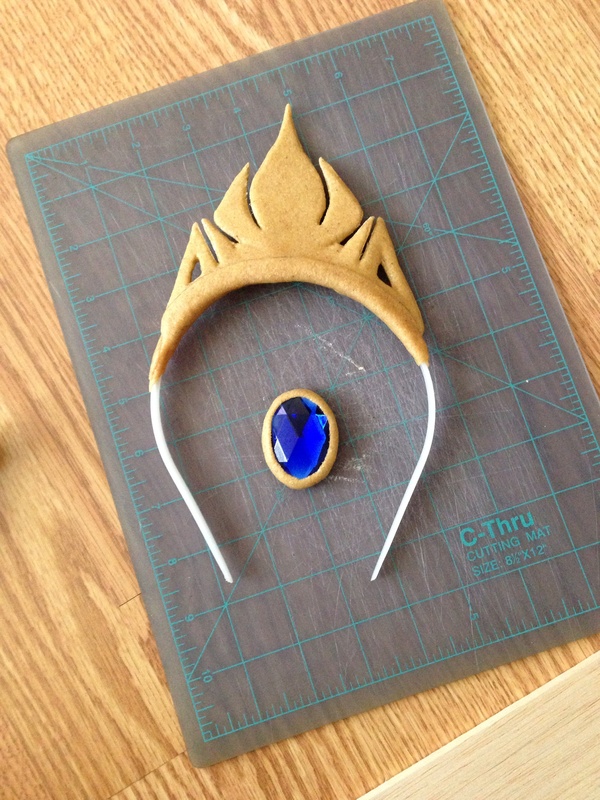 The brooch is also made from a vintage rhinestone, craft foam (for backing), and worbla. I started this project around March 25 and hope to finish it by the end of next week (April 16). It’s probably the most involved costume I have ever made simply for the time and all the techniques used. It looks great on a dress form so I am very hopeful it will look good put together. One of my goals was to complete the Effortless Cardigan. I love cardigans (I think I’ve said that before) and this cardigan is especially fun because of the long front pieces you can wrap around. I wanted to knit this in alpaca yarn (my current favorite fiber) and my local store had just enough Paca Tweed by Plymouth Yarns in a gorgeous red wine color (I later learned that Paca Tweed is discontinued so I got lucky). The yarn is aran weight and the pattern called for worsted. This resulted in the fit being fine but the length being longer than the pattern called for. This suited me just fine because I was feeling like the body was too short for my tastes. I feel like the sleeves are too short even though I knitted them an inch longer than called for, but I can’t be bothered to undo all my ribbing. 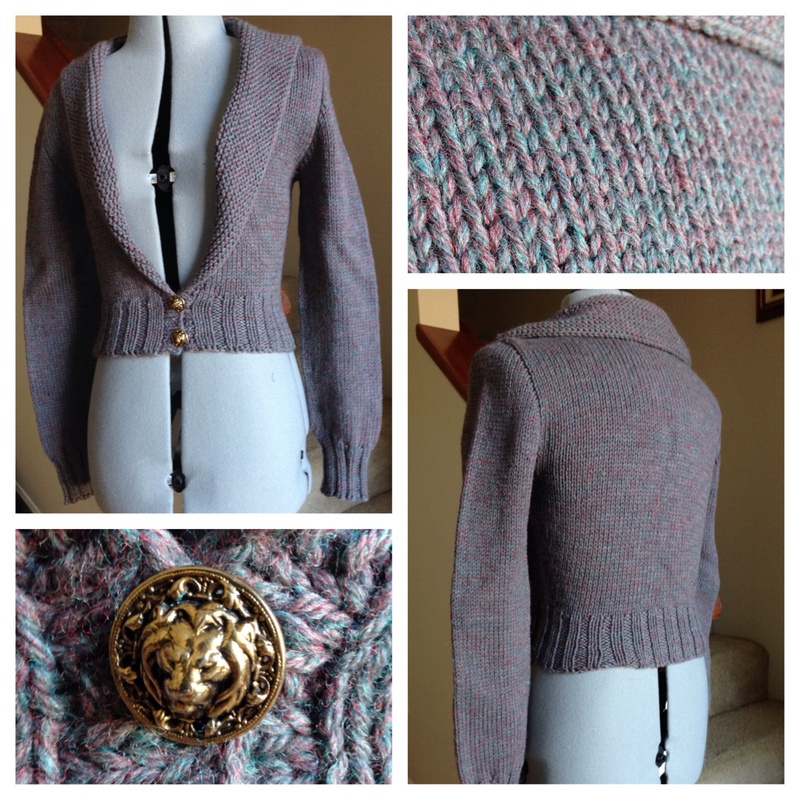 Speaking of ribbing…this cardigan had so much of it. I didn’t realize how long it was taking me to do the ribbing until I got to the collar part. Nearly 5 hours for 18 rows of 186 stitches. The bottom ribbing had over 200 stitches, and each side had 46 stitches. Needless to say, I am taking some time to rest my wrists and shoulders before tackling my next knitting projects (hats and cowls for gifts). Blocking this was…interesting. Blocking always makes my projects larger than intended even when I am on target with gauge. I don’t overly manhandle my knitting either; I roll the project onto itself once to get out as much water as possible, then wrap it in towels and step on it a few times to get out excess water. I never wring or stretch the project while it is wet, and yet it still manages to come out larger than anticipated. Maybe I should knit a size smaller next time? It’s also a bit of a pain to block projects when you have cats. I love my four legged babies, and Kulin is so good and leaves my projects alone. But Kuro…if you don’t watch him, he will try to eat the pins and in so doing snags his claws on the stitches. The night I first blocked this project, he kept me up half the time being a pain in my bum. The next night I used our drying rack since the cardigan was dry enough not to stretch out. Kuro has nearly ruined three projects this way. Our spare bedroom doesn’t get air circulating enough to dry projects, and we hate locking him out of the bedrooms. Guess I’ll have to keep finding ways to get him to behave (none of the usual techniques work on him). I still love wearing cardigans, but I think I am done with knitting them. 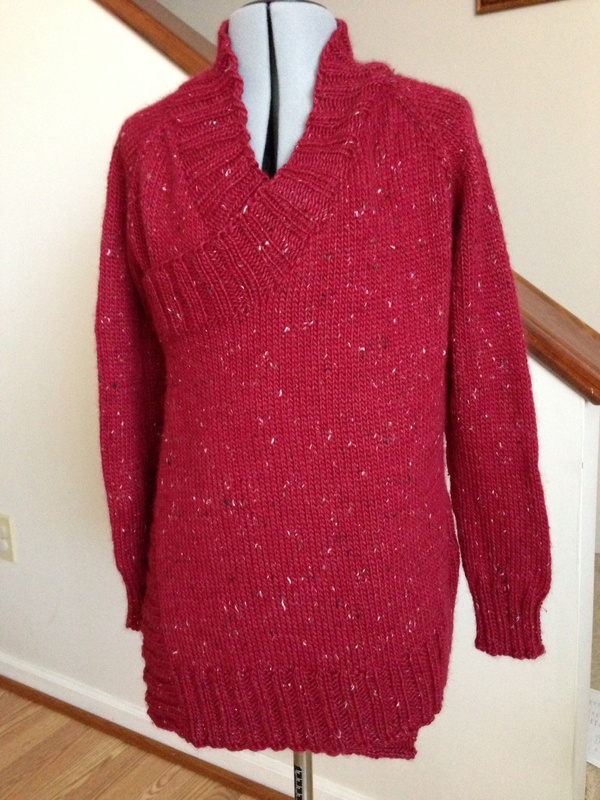 I still have 3 more sweaters on my to-do list but thankfully they are all pullovers. Before 2013 ended, I finished knitting two cardigans by Andi Satterlund and was in the process for finishing a Ginny Weasley inspired owl cardigan. I didn’t call any of them “done” since I didn’t block them. Each of them has a lovingly made mistake somewhere that just goes to show how imperfect of a knitter I am. Marion is the first cardigan by Andi that I completed knitting in September. I used Knit Picks Wool of the Andes in Dove Heather. The yarn was originally intended for a Hermione fair isle sweater but I frogged the project. The bottom band and neck band were completed before I discovered the wonderful thing known as a stretchy bind off. I also made one tiny mistake in the cabling on the right side but it’s not very noticeable. I plan to knit Marion in a lovely yellow at some point. 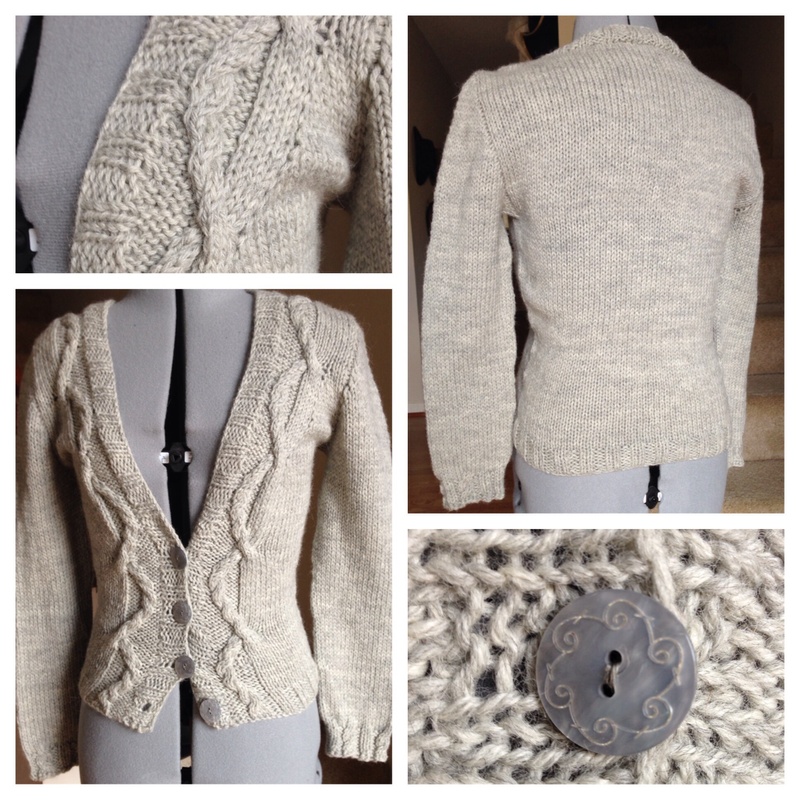 Hortencia is the second cardigan by Andi that I started and completed in November. It was actually done as a test knit for her pattern. Knit in Cascade 220 Heathers in a lovely shade of dusty purple, it’s a cropped cardigan with full length sleeves and a collar. I have the perfect dress to wear with it, and the heathered yarn makes it lovely to pair with other pieces. The mistake in Hortencia is in the collar; somewhere on the left side I picked up two stitches in the same place resulting in a hole. However, due to the wide collar the hole is safely hidden from sight. 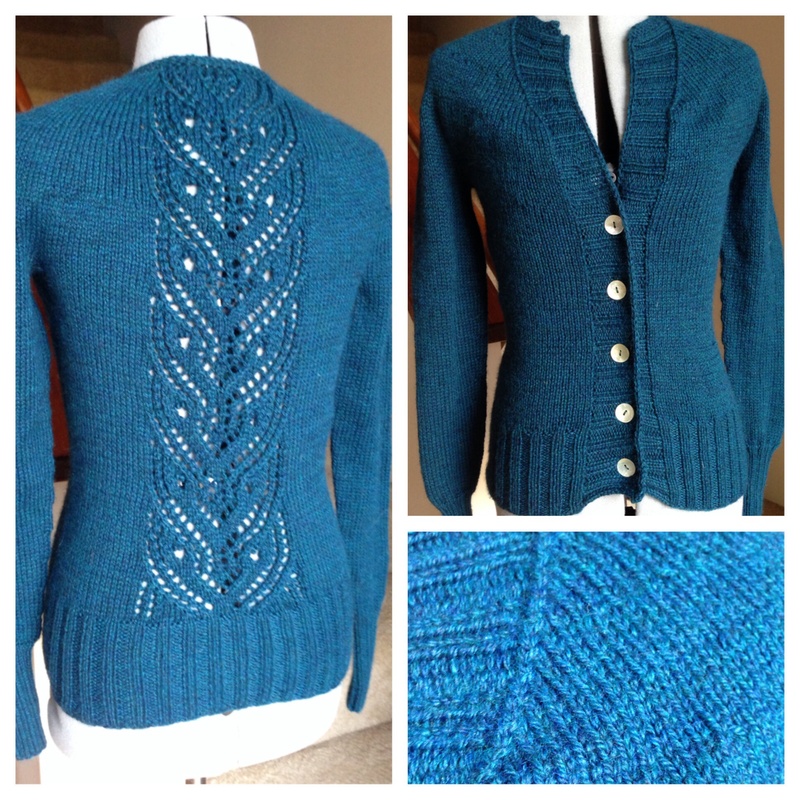 Ginny’s cardigan is knit from Berroco Vintage DK in a dark teal color. I picked the yarn for it’s washability and it’s color. If I had to go back and do it again, I think I would have chosen Berroco’s Ultra Alpaca instead since the nylon strands in Vintage DK felt “weird” in my hands (I find I am more of a wool/alpaca blend kind of girl). I make a mistake on the third owl from the bottom, but it’s not very noticeable. I left off the decorative pockets since they are not very functional in their small size (I need functional pockets). Blocking this was a bit of a pain since the Vintage DK contains nylon and acrylic, neither of which blocks very well. 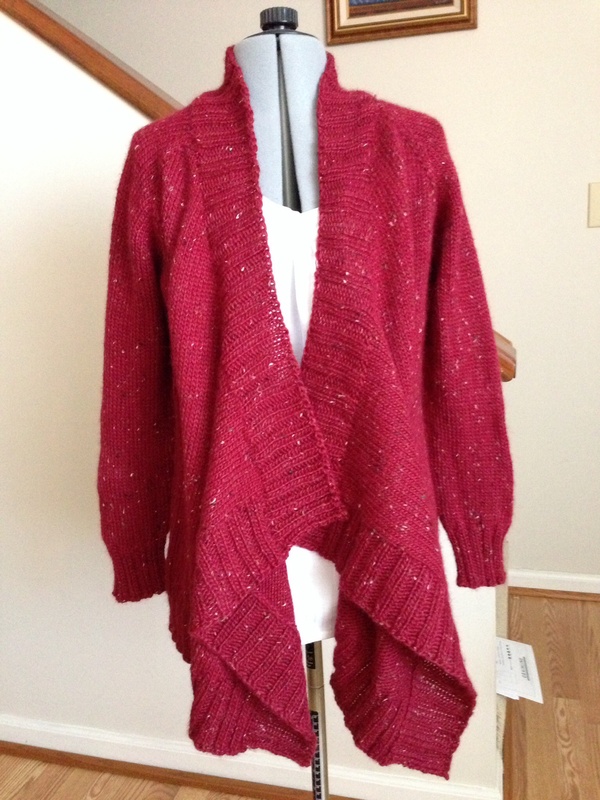 It took me so long to consider these cardigans complete because I have been adverse to blocking. It’s not as bad as I thought it would be, but wool/wool blend with alpaca definitely blocks better than wool blend with nylon/acrylic. It takes a long time to dry though; I had to lock the projects in my room while they dried to prevent one of my cats from playing with them and ruining all my hard work. While I love wearing cardigans, I am slowly not liking knitting them. Except for Andi’s cardigans (which are cropped and quick knits), they take forever. I thought I would never get done with Ginny’s cardigan. The back and forth knit and purl rows were starting to drive me crazy. I have one more cardigan on my 2014 plans but the rest are pullovers.